Pan Seared Sirloin Steak Dinner for Two just in time for Valentine's Day! This is the perfect meal for a romantic Valentine's Day dinner for two. A steak dinner is easy to make and budget friendly too! I like that! Today, the Sunday Supper Tastemakers are sharing a collection of Easy Dinners for Two. This collection is perfect if you are just starting out and only have two for dinner every night, or you find yourself at the other end of the spectrum, like me, where everyone has left the nest and you are struggling to scale recipes down to fit your new lifestyle. Maybe you are just looking for easy recipes to surprise that special someone with a romantic dinner for two at home this Valentine's Day. Regardless of the reason, Sunday Supper recognizes it can be challenging to cook for just two, and we wanted to solve that problem with a collection of recipes! The sirloin medallion, or sirloin filet it is sometimes called, is a thicker sirloin steak that resembles the look of a filet mignon. Some people refer to it as the 'poor man's filet'. I'm fine with that. I might be crazy, but I find the sirloin has more flavor than the filet. It's true, nothing much compares to the tenderness of the filet, but I'm willing to chew a little more to save $12 per pound!! 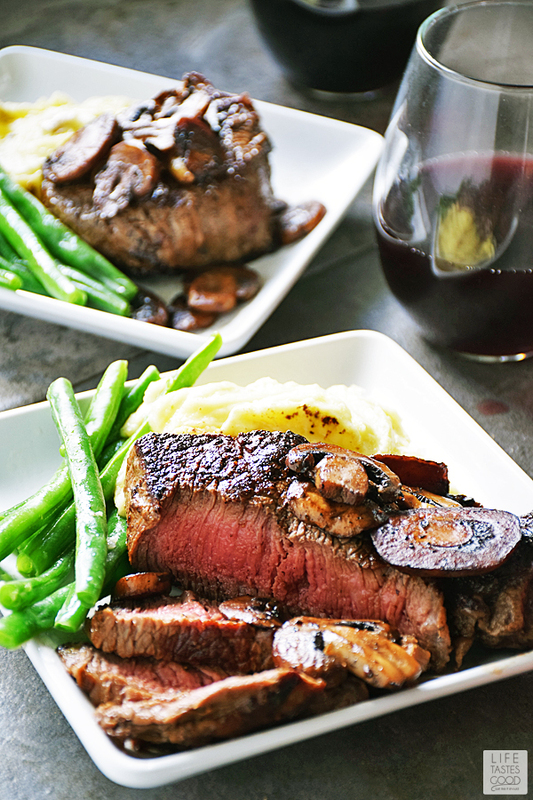 I paired this juicy steak with creamy, dreamy garlic mashed potatoes, fresh steamed green beans with just the right amount of crisp, and the biggest flavor enhancer of them all, mushrooms sauteed in luscious, sweet butter for the ultimate steak dinner for two! The entire meal is divine and will cost less than $15 total! That's for 2 meals y'all! Steak dinner for TWO! 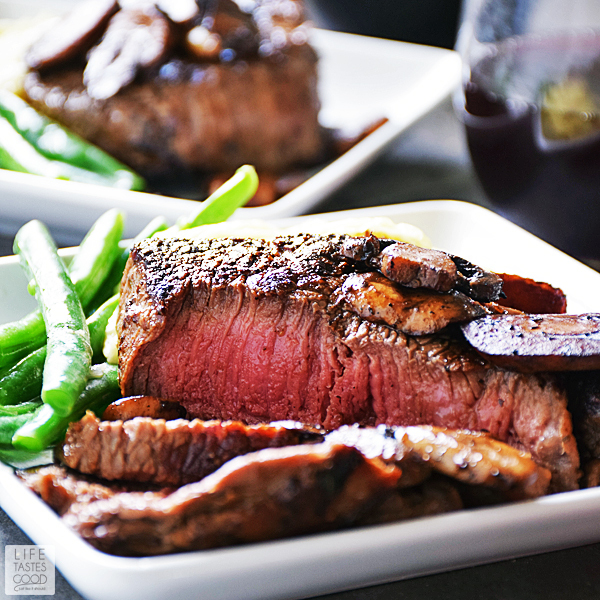 Under $7.50 per person for this stunning steak dinner! I call that winning! How 'bout you? With a few recipe prep tips, you can get this steak dinner for two on the table in about 35 minutes. Less time in the kitchen means more time to share with someone special. This is also an easy recipe to enjoy some quality time together in the kitchen. It can be fun and romantic to split up the prep work and the cooking between two people and make dinner together. Prepare a special dessert early in the day or even the day before to have ready when you want to enjoy. I recommend my Strawberry Jelly Roll Cake Recipe. It's an impressive dessert that is much easier to make than it looks. It's a wonderful make-ahead dessert for a special occasion. Preheat the oven to 250°F to have it ready to keep the potatoes warm. Additionally, if your steaks are extra thick, they might need to finish up in the oven, so it's good to have it ready. READ through the recipe first. Below, in the recipe instructions, I give step-by-step directions of what to do, and when, in order to have everything ready at the same time. For best results when searing the steaks, use a cast iron skillet. Stainless steel skillets work well too, but don't use a non-stick skillet as you won't get a good sear on the steaks. It's all about the sear! Always use the best quality beef you can afford. I recommend Certified Angus Beef® Brand for maximum flavor and tenderness. You also want to use steaks that are 1 1/2 - 2 inches thick. Always use an instant read thermometer to check the cook on the steaks. Digital read thermometers are available if you prefer that easy read display. Refer to this chart for degrees of doneness and remember to always cook 5-10° below the desired doneness to allow for cookover. For best results with the mashed potatoes, I like to use the potato masher on my Smart Stick. A mixer will work too, but be careful not to over-mix or the potatoes could turn gummy. Best to mix on low-medium speed. Be prepared! Gather all of your ingredients together first to have everything handy as cooking this dinner moves along quickly. Don't be intimidated by the rather long list of instructions for the recipe. They are long because I walk you through how to get all the elements of this meal on the table at the same time in an efficient way. Please leave me comments to let me know how this worked for you or if you have suggestions on how you think it could be better. Thanks! Pan Seared Sirloin Steak Dinner for Two just in time for Valentine's Day! This is the perfect meal for a romantic Valentine's Day dinner for two. It is easy to make and budget friendly too! Preheat the oven to 250°F to have it ready to keep the potatoes warm. Additionally, if your steaks are extra thick, they might need to finish up in the oven, so it's good to have it ready to go. Place cubed potatoes in a saucepan with 1/2 tablespoon kosher salt, 2 to 3 cloves of peeled garlic, and enough water to cover the potatoes in the pan. Set the pan over high heat and bring to a boil. Reduce heat to medium and simmer until potatoes are fork tender. About 8-10 minutes. While the potatoes are boiling, set a cast iron skillet over mid-high heat to get the pan screaming hot. Just leave it to let it heat up until you are ready to sear the steaks. While the skillet is heating, season the steaks with 1/8 teaspoon kosher salt and 1/8 teaspoon freshly cracked black pepper on both sides of both steaks, and peel 2-3 cloves of garlic. Keep the peeled garlic with the steaks, 1 tablespoon ghee (or oil), 2 tablespoons butter, and a couple sprigs of thyme together in one place to have all of this handy when ready to cook the steaks. Set aside for now. Prepare the green beans: Trim the ends off the green beans. Prepare the steamer for the green beans by adding about 2 inches of water in the sauce pan and setting the steamer basket on top. Put trimmed green beans in the steamer basket and season with salt. Set on the stove top until ready to cook. Don't turn the heat on yet or you'll have mushy beans. The skillet should be screaming hot by now. Add 1 tablespoon ghee (or oil) to the hot skillet and immediately put the steaks in the skillet. Let sear for 4 minutes and then turn over (Be sure to set the timer so you don't over-cook). Add 2 tablespoons of butter, a few cloves of garlic and a couple sprigs of thyme to the skillet and let the steaks sear another 4 minutes while using a spoon to baste the steaks with the garlic-thyme butter in the skillet (be sure to set the timer so you don't over-cook). Check the internal temperature of the steaks with an instant read thermometer. We like our steaks mid-rare, so I cook them to 120°F and then let them rest. This results in a cook like you see in the photos. If your steak is not up to temperature, transfer the pan to the oven and allow to cook for about 3-5 more minutes until it reaches the desired temperature. Keep checking with the thermometer so you don't over cook. Drain and mash the potatoes with 2 tablespoons butter and 2 tablespoons heavy cream. Taste and add salt and pepper as needed. Cover with foil and place in oven to keep warm. NOTE: For best results with the mashed potatoes, I like to use the potato masher on my Smart Stick. A mixer will work too, but be careful not to over-mix or the potatoes could turn gummy. Best to mix on low-medium speed. When the steaks are ready, remove the steaks to a cutting board to rest for 10 minutes. Put the lid on the steamer basket and set the pan over mid-high heat. Allow the green beans to cook while the steaks rest. Set a timer to check these in about 6-8 minutes, so you don't overcook. While green beans are cooking, melt 2 tablespoons butter & a pinch of salt over medium heat in the same skillet you cooked the steaks. Add the mushrooms and saute the until they release their juices. About 5-8 minutes. Taste and season with salt and pepper to your liking. Check green beans periodically so they don't overcook. I like them still a little crisp, but cook them to your liking. When the green beans are done, remove them from the heat to a serving dish. Make garlic butter in a microwave safe dish with 2 tablespoons unsalted butter, 1/8 teaspoon freshly minced garlic and a pinch of salt. Microwave about 20 seconds until butter is melted. Stir to combine and pour desired amount over green beans. Reserve any remaining garlic butter to pour over mashed potatoes if you like. Place a steak on each plate with mashed potatoes and green beans. Top each steak with sauteed mushrooms. Enjoy! I prefer a sirloin too! Marion your photos are beautiful! I love sirloin steaks, very flavorful in mho. Hey, this looks delicious! Cast iron pans are making a comeback, so, I'm wondering if you can add some information to recipes that use them. Unlike non-stick pans, cast iron pans are one piece construction. The handle part of the pan, not a separate piece. So, for people using them for the first time, they may not realize that the handle, even if the pan is used on the stove top, will get very, very hot. Even if you use a cast iron pan on the stove, you need pot holders on the hanlde. Can’t wait to make this for Valentines Day. Just wish you had a print feature so we don’t print all the ads. Makes it harder to follow. A print plugin would be great. 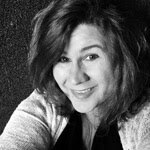 Hi Karen, I do try to write the recipes so they are easily to follow from your device (ie - include measurements in the instructions so you don't have to scroll up and down), however, I am happy to send a printable version of the recipe via email. Please email me at marion@ourlifetastesgood(dot)com and I will send that to you.